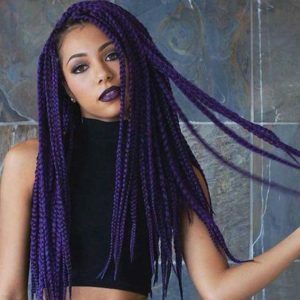 Out of all the hairstyle trends that have gained popularity in recent years, purple hair is one of the most fun. Purple braids are especially popular because they don’t require you to dye your own hair and allow you to experiment with a new color while wearing a protective style. 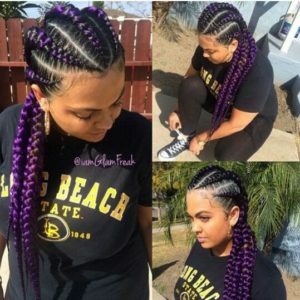 The best part is that it doesn’t matter whether you want a bold, bright, all-purple look, a style with just a hint of purple, or a darker shade that’s more subtle, because there’s a look for just about everyone. Let’s take a look at the many different ways you can rock purple braids. 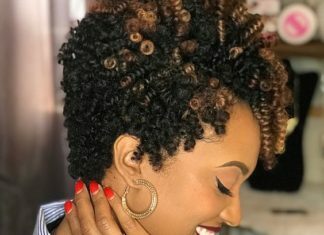 There are a few things to consider when you’re contemplating your next hairstyle. Purple is one color that looks good on everyone, but choosing which shade of purple you want to commit to is a matter of personal preference. 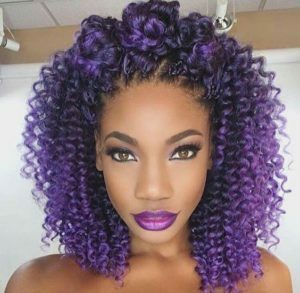 Darker shades of purple tend to look more subtle and could be a good fit if you are more conservative about color. 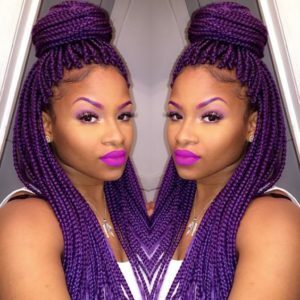 Lighter shades of purple tend to create a more dramatic, vibrant, and eye-popping look. 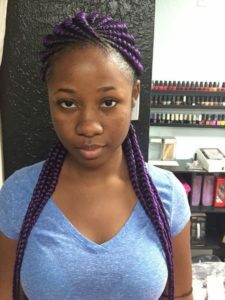 When it comes to braided extensions, consider how the length and thickness of the braids will affect the weight. 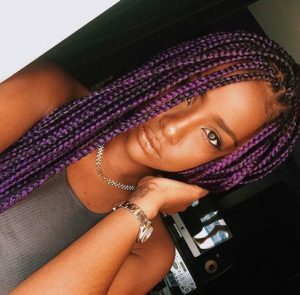 Thinner braids will weigh less individually, which could put less tension on your roots. 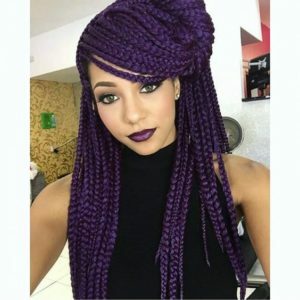 On the other hand, thicker braids use larger sections of hair, which may be able to withstand more weight from the added hair. 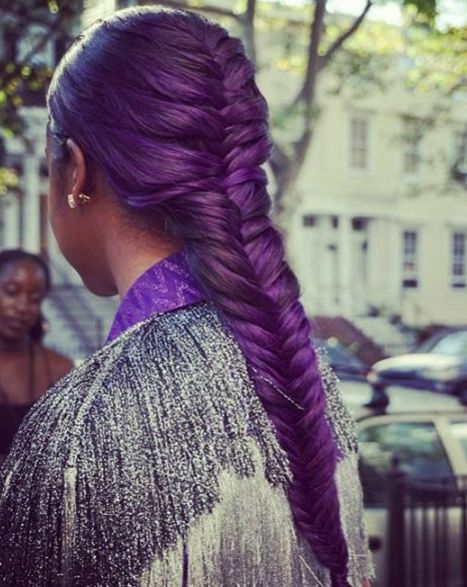 Let’s take a look at the many different ways you can rock purple braids. These gorgeous waist-length box braids are perfect if you prefer a deeper shade of purple. 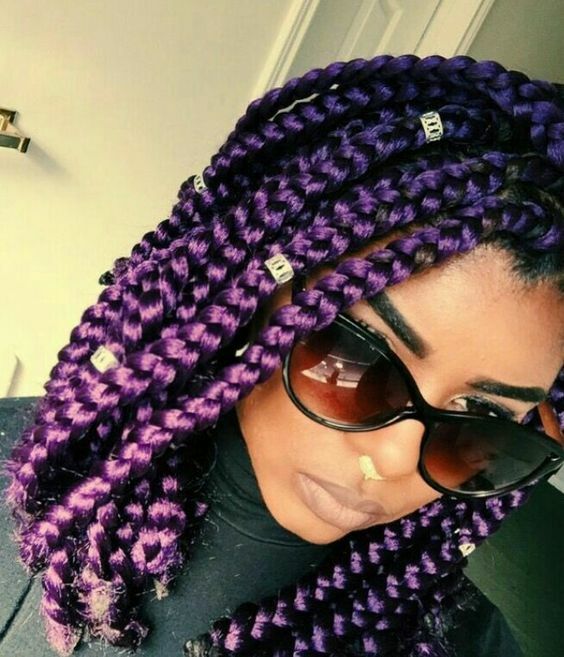 Pair them with a matching shade of lipstick for an even bolder look. 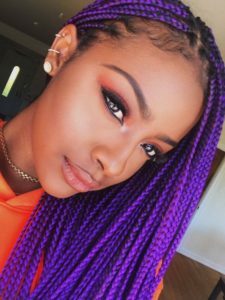 These pretty purple box braids are styled into a cute half up half down style by wrapping the braids in the front into a simple high bun. These beautiful purple box braids are sure to turn heads with their vibrant color. Hints of pink braiding hair add to the overall vibrancy of the color. 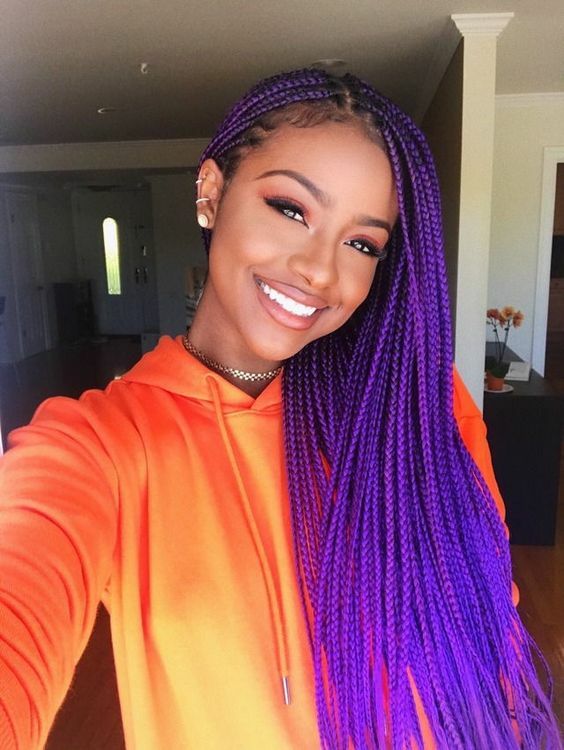 If you are currently rocking a straight look and want to experiment with purple color, there are a variety of ways to do so. If you don’t want to commit long-term to purple hair, temporary hair dye or colored extensions can be used for a style like this gorgeous fishtail braid. 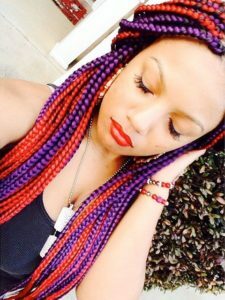 Red and purple braiding hair is used to create this bright, bold style. 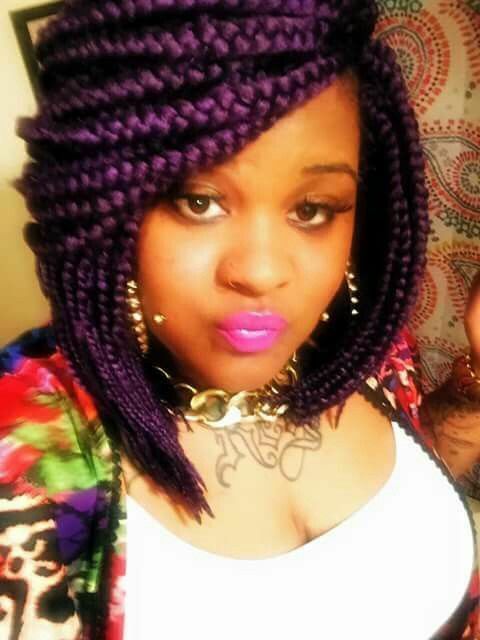 The two colors complement each other well and create a fun, colorful look. 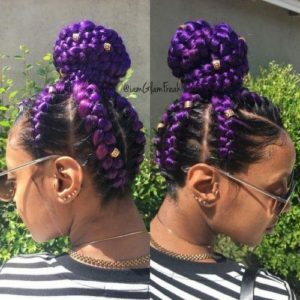 Purple and black braiding hair is used to create this gorgeous jumbo braid, which is then wrapped into a bun in the front, allowing the end of the braid to fall over one shoulder. 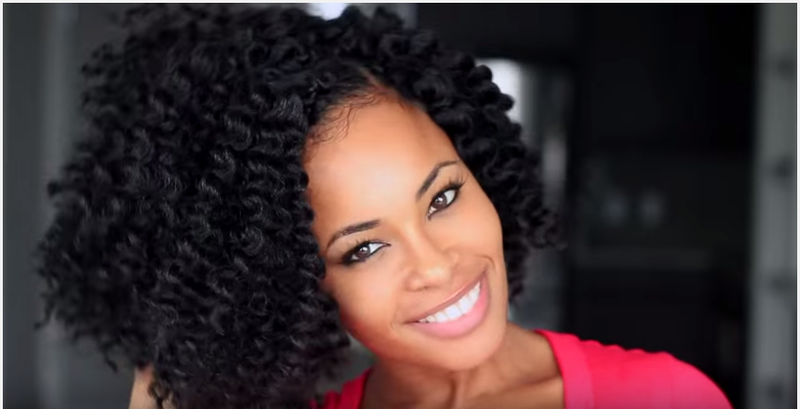 This chic look is great for every day or a special occasion. 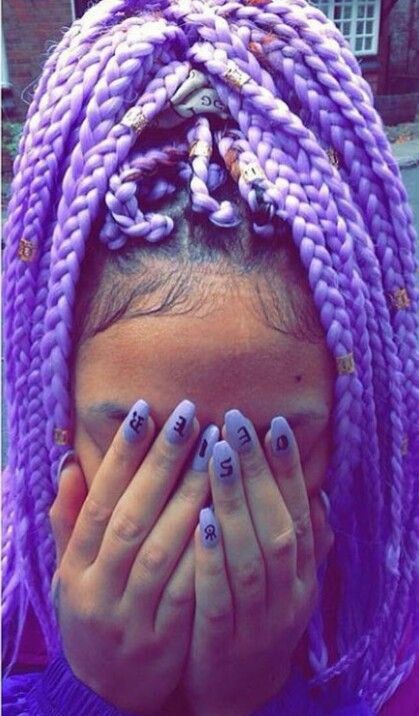 This is a truly unique way to wear purple braids. 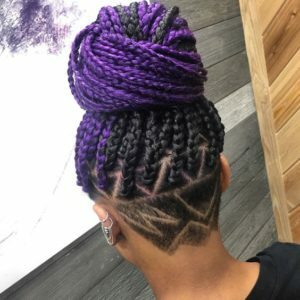 Purple braiding hair in the front paired with black braiding hair in the back creates an interesting look, especially when pulled up into a high bun, which is a great way to show off a shaved design in the very back of the head like this one. 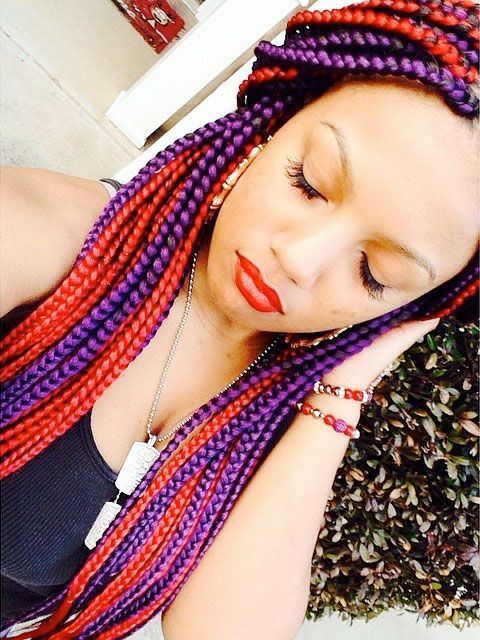 These fun multi colored yarn braids are perfect for those bold enough to rock them. 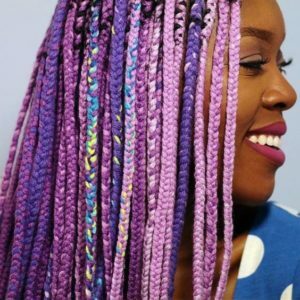 Acrylic yarn tends to come in many more colors than braiding hair, so the color combinations you can create are almost endless. Black and purple braiding hair can be used if you want a more subtle purple look, like these pretty deep purple box braids. If you prefer a lighter shade of purple, these lavender box braids may be just right for you. 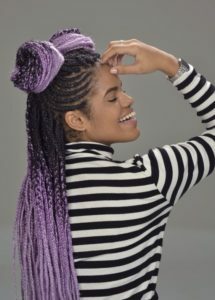 Less common than darker shades of purple, these braids are sure to make you stand out in the crowd. 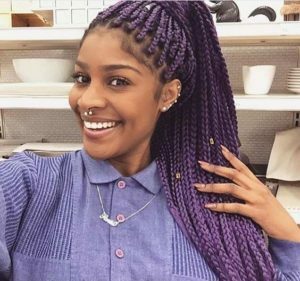 If you’re not ready to go full purple, consider an ombré look like this one where the color is focused mainly on the ends of the braids. 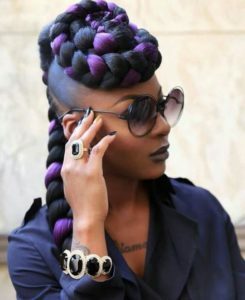 These braids would also create an interesting contrasting color effect pulled up into a high bun. If you like thicker braids, these purple box braids might be more your speed. 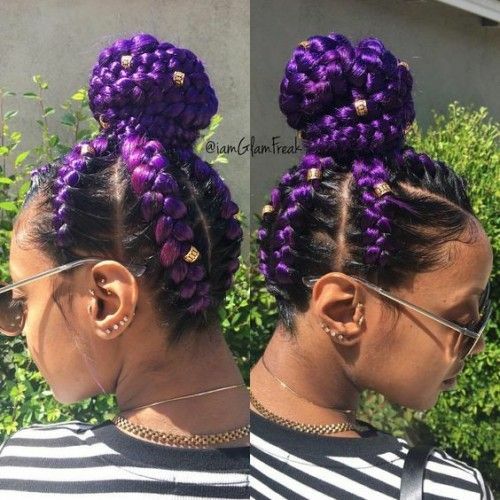 The rich purple color really makes this style pop. 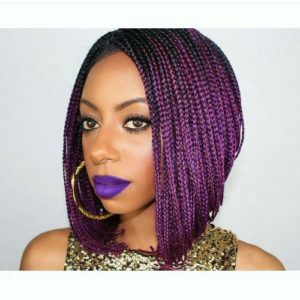 These bob length box braids are great for those who want to experiment with purple while maintaining a shorter length. These gorgeous goddess braids feature shades of black, brown, and purple, creating an interesting color combination. 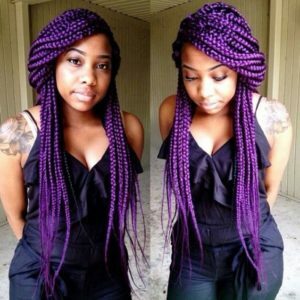 These large purple box braids are great if you want a style that falls right around the shoulder. 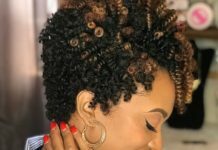 Gold beads offset the color and help dress up the style. Shades of purple and indigo intertwine, creating a gorgeous color combination in this style. 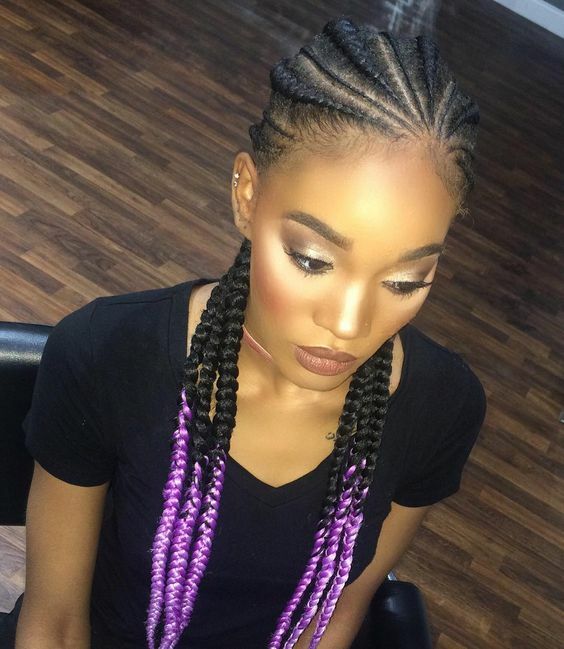 These long box braids look great pulled up into a high ponytail and embellished with gold beads. 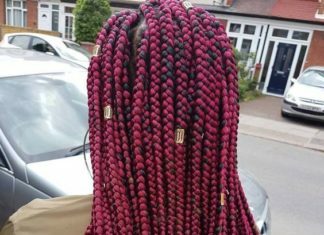 If box braids aren’t your thing, these purple Ghana braids might be just the style for you. 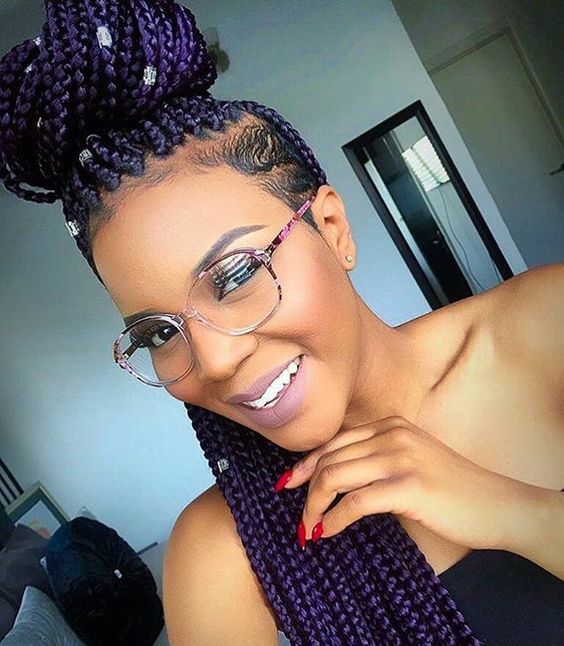 Pretty and chic, Ghana braids are the perfect protective style for any time of the year. 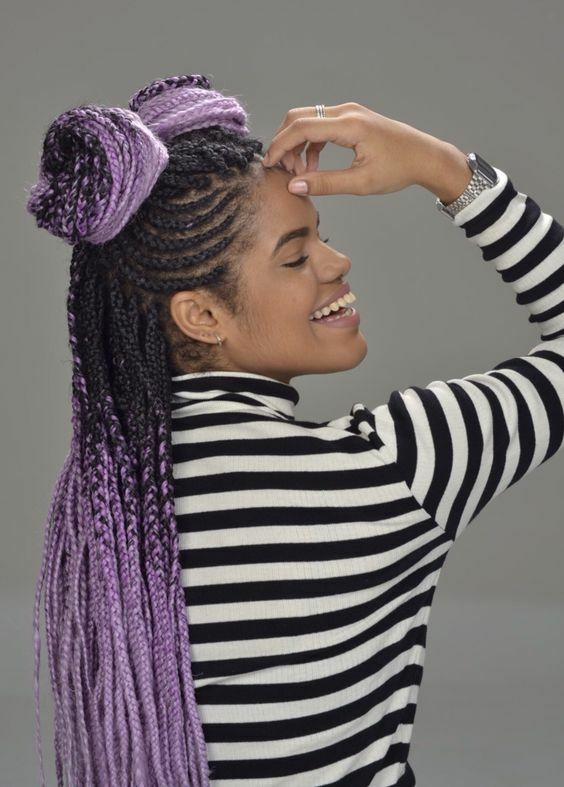 Whether you want a low-maintenance protective style or a chic updo, this chunky purple braided high bun does it all. Purple color on the ends gives these beautiful Ghana braids an interesting ombre effect that’s sure to make them stand out. 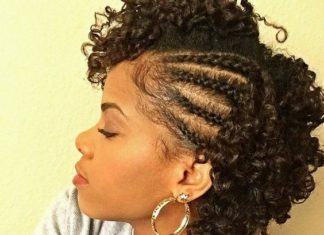 These gorgeous, thick cornrows are braided towards the crown of the head, then wrapped into a pretty high bun. Gold beads help offset the pretty purple color. These purple box braids are styled into a chic stacked bob: shorter in the front and longer in the back. 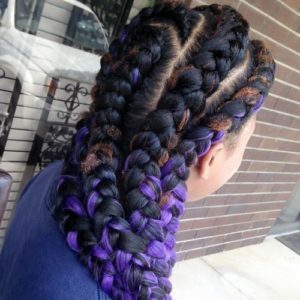 Multiple shades of purple and black braiding hair is used to create a multi dimensional color pattern. 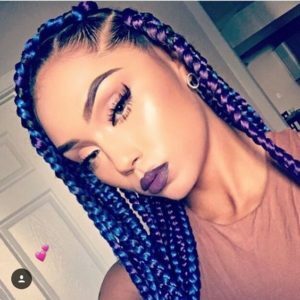 Feed in cornrows like these have become more and more popular in recent years. Rich purple color helps add a little something to this common but nevertheless gorgeous style. 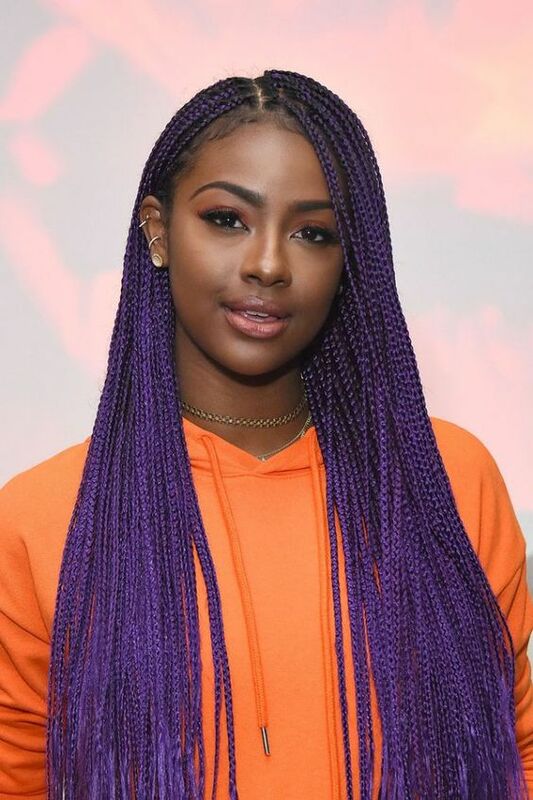 The illusion of a swoop bang is created on these purple box braids by parting them on one side and tucking and twisting the braids around the crown of the head. 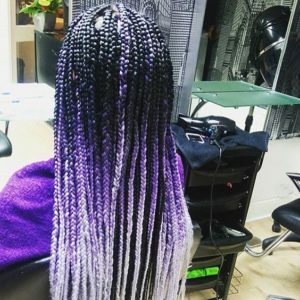 Probably not what comes to mind when you think about purple braids, but these pretty purple crochet braids provide a plethora of styling possibilities. 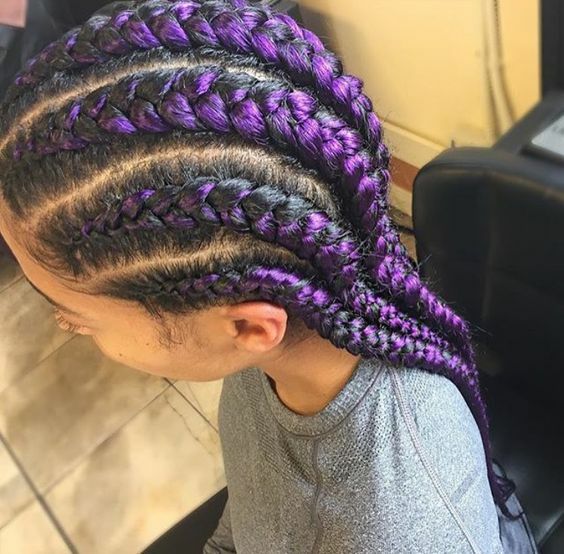 These straight back feed in cornrows are streaked with purple, giving this classic style an edgy kick. 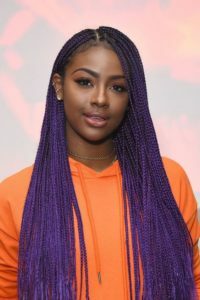 Lavender braiding hair is added to the ends of these box braids, creating a pretty ombre effect. Half of the hair is pulled up into to two high double buns while the rest of the braids hang loose in the back. These pretty lavender box braids are embellished with beads and pulled into a high ponytail. Vibrantly colored acrylic yarn can be used to create this style. These pretty jumbo box braids are a great choice if you like large braids. 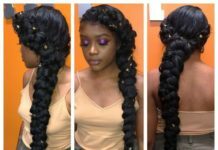 They also take less time to install than thinner box braids. These hip-length box braids can be styled in a variety of ways, like this half pinned back look which is both simple to create and practical if you want to keep your braids out of your face. 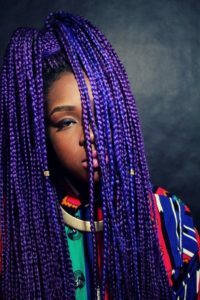 If you want a fun style that stands out from the rest, try these beautiful blue and purple jumbo box braids. This gorgeous combination of colors is sure to attract more than a few stares. 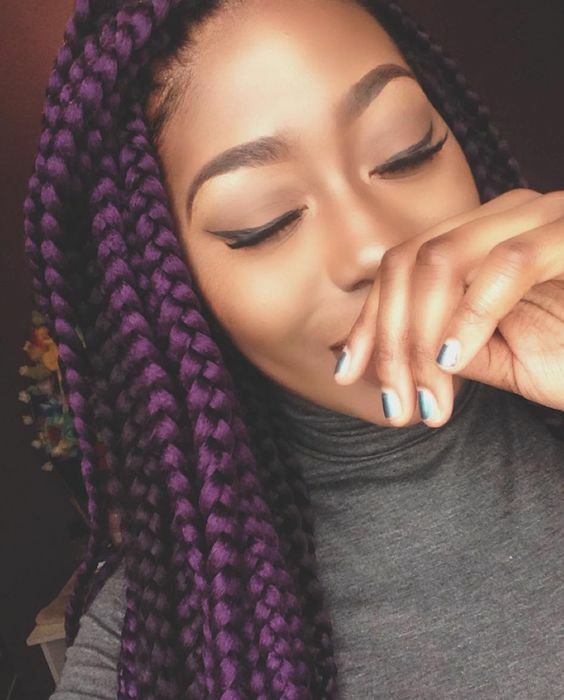 This shade of purple is ideal if you can’t decide between a dark purple and a light lavender. 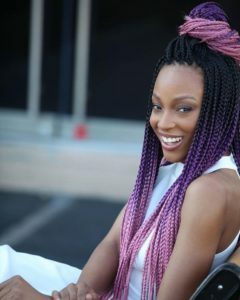 These box braids look great pulled up into a fun high ponytail. 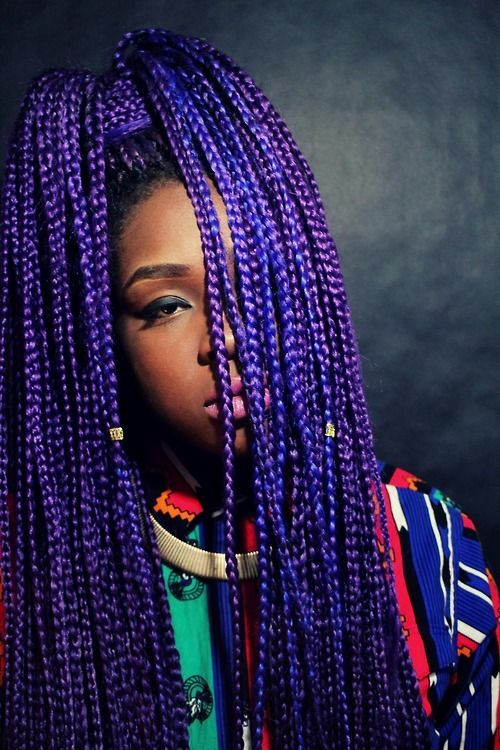 These long purple braids are a perfect example of the beauty of classic box braids. 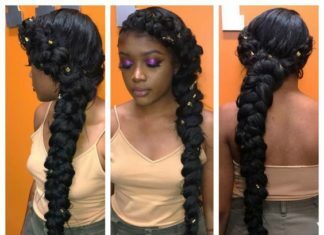 They are long enough to style in many different ways but look just as great when left down. 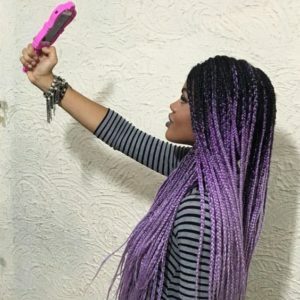 These long lavender box braids will keep you camera-ready at all times. 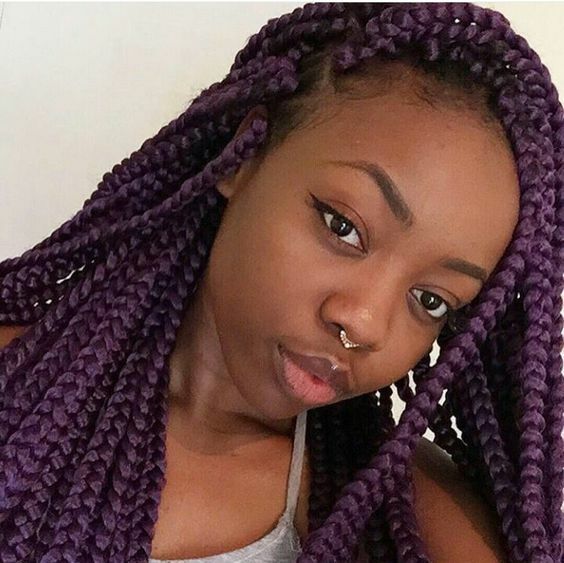 The lavender color doesn’t start at the roots, creating a nice color contrast. If one side of your head is shaved, this is a great way to rock purple braids. 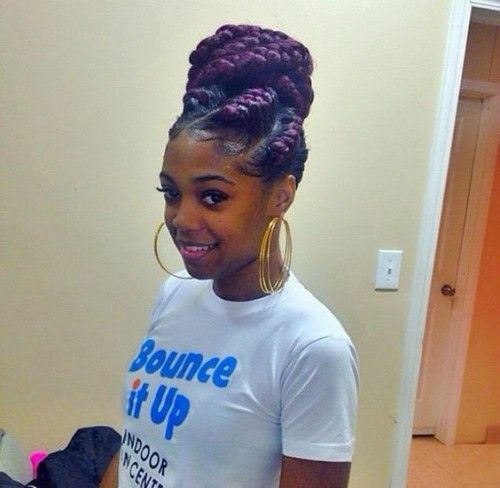 Half of the hair is pulled up into a neat bun, while the rest hangs loosely on one side of the head. 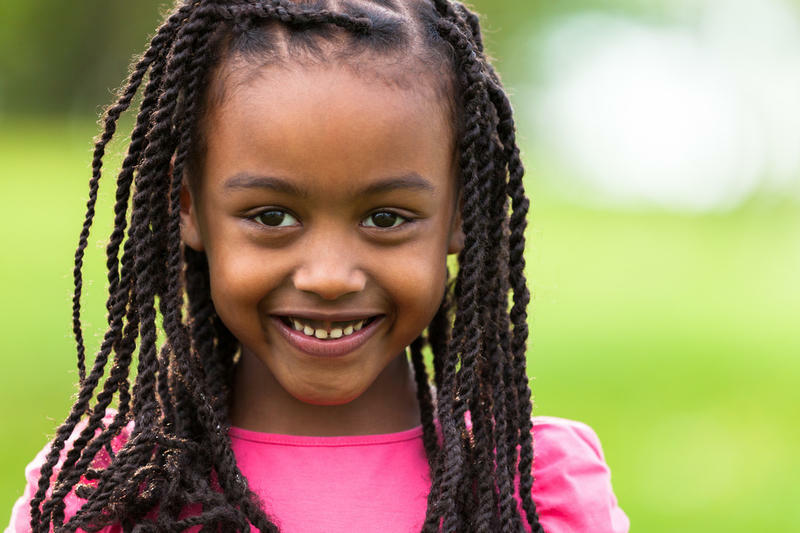 Accessorize with a few silver beads for an even cuter look. This gorgeous style can be created with braiding hair that gradually fades from black to purple to pink. 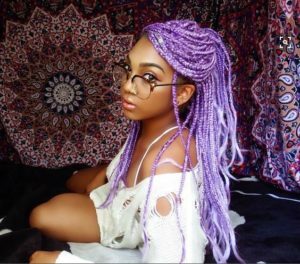 The result is an incredible multi colored ombre effect. This look is sure to stand out since most ombre styles only have two colors instead of three.